David Brooks can’t resist the old DC one-step. People who say “education is really important, but it’s not the only determinant of wage growth” become people who disparage the importance of education. Clearly, education matters a great deal but so too does bargaining power, political power, and absence of precisely those forces on behalf of those on the wrong side of the inequality divide, including many with college degrees. Moreover, while our education policies are not supportive enough in ways I’ll note in a second (this stuff is all in my forthcoming book), we do A LOT more to address education gaps than power gaps. Brooks makes two mistakes, the second of which is actually portentous. First, he says the hourly wage of people with four-year degrees is 98% above those without. Not according to EPI’s data here. It’s 73%, which is still a very large and important premium. Economists like to make this comparison by controlling for other individual wage determinants, of which age, along with education, is the most important. That shaves over 20% off of the unadjusted premium. Still, 50% is an historically large premium and we should do everything we can as a society to ensure that those with the drive and capacity can get to and complete college (this latter point about completion is increasingly important). This brings me to Brooks second flub, which I think of as the Sarah Palin tactic in this debate. There’s a scene in the movie “Game Change,” where the Palin character was being prepped for the Vice-Presidential debate. I’m paraphrasing, but her debate coach basically said, “just end every answer with: and that’s why educating our children is so important!” I have no idea if that’s how the coaching actually went but that was kind of what the real Palin ultimately did. The problem is when you take an issue like this and reduce it to “we need more education!” you lose the critical nuance about what’s most problematic here: the barriers to education, from pre-school to grad school, facing less advantaged households, which increasingly include many in the middle class. In other words, educational access is another dimension of the inequality problem, the bargaining power problem, the political clout problem, and so on. You see this in the data whether you’re looking at pre-school, K-12, or college. 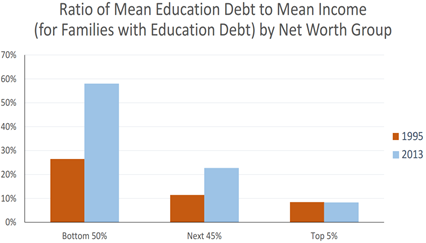 You see it regarding the college debt burden (see figure). You see it in the “enrichment goods” that families buy for their kids–the art and music lessons, tutoring, sports, etc. You see it in funding levels for public K-12 schools that still reflect property values. I’ve got all the data in my book. It is essential to understand these linkages between the inequality of outcomes and the inequality of opportunities, including educational opportunities. This more holistic analysis is what’s critically missing from Brooks and other educationistas who are motivated less on solving the education problem and more on beating up on “liberals” (somehow Brooks morphs this all into a swipe at Hillary, though I’m not at all sure how he gets there). Of course education matters–“that’s why educating our children is so important!” Despite Brook’s straw men–all un-named, btw*–I don’t know any economists who disagree. But it’s not the only thing that matters by a long shot, and it’s extremely important to be clear about who faces the steepest educational barriers. Summers was making an accurate observation about a labor market problem we’ve been facing for years now. If Brooks had then looked at the more broader policy document that grew out of a project that Larry co-led for the Center on American Progress, he would have seen a robust education policy agenda much in the spirit I spoke to above (starting on page 136). That might have hurt his one-step narrative, but it would have accurately represented the views of the person he was quoting. Share the post "David Brooks does the Palin one-step"
2 comments in reply to "David Brooks does the Palin one-step"
Used to be you could go to the BSL (Bureau of Labor Statistics) website and gather useful aggregate data on education levels and projected job growth. No more. If you can locate the same of kind of information now as was routinely given a few years ago, please let me know. The site used to give a few graphs outlining job prospects, from new and replacement needs (which accounts for 63% of openings) broken down by education level. Today instead, they still give top growing jobs in categories of educational attainment, but not the all important roll-up info which would clearly expose the fallacy of thinking education could solve many economic problems like inequality. The opposite is true for many, more college graduates would lower high skilled wages, while the endless global supply of low skilled workers would ensure low skill labor shortages still failed to boost earnings for anyone without bargaining rights.